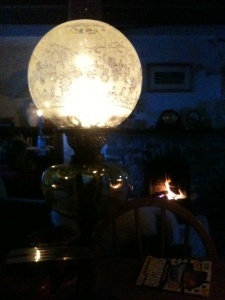 We lit the paraffin lamp, cooked on the fire and went back in time. Earlier in the week we had a storm. The sea was churning with wild waves and the wind howled and battered the cottage making the windows rattle in their frames. Then the power went off. ‘Most unusual for this time of the year’, everyone said. It was fun for an evening. My mum and auntie were staying. We lit the paraffin lamp, and the coals glowed hot in the fireplace, becoming our cooker and kettle as well as our source of heat. We enjoyed the flickering warmth, the intimacy and the spirit of old-fashioned self reliance. Come morning, however, there was still no electricity, my phone was dead, the others had left and I was grubby, smoky and ready for a hot shower. I felt like I was slipping off grid. To take my mind off such thoughts, I went for a walk around the coast. It was low tide and I tramped along the shoreline, shells crunching underfoot. Small white horses trotted on the waves, but the sky was blue and the hills clear across the water. I came to the burn that runs into the sea at the end of the bay. It was in spate and water surged over the wobbly stepping stones. Just above the stones there’s a pool. It’s deep and calm and stained the colour of tea by the peat. A quick plunge in these icy waters soon sorted me out. I had a sudden urge to swim in it. It’s a private spot – the trees huddle close, their branches bowing low over the water. The clouds scudded above and the sun suddenly appeared, sweeping a bright wash in its wake. It dappled the pool and warmed the top of my head. I quickly stripped and slipped in off the high, grassy bank, feeling the soft, icy water flow past and out to sea. It was just me, the burn, the trees and the last of the bluebells. I didn’t stay in long, it was too cold, but my body soon warmed and tingled as I dried myself off with my t-shirt, got back into my clothes and ran away from the gathering midgies. I’ve just read Waterlog, Roger Deakin’s book on wild swimming. He writes beautifully about its pleasures and benefits. Launching yourself into cold water must be the best mood booster there is. It’s a leap of faith – one of those things that doesn’t make sense until you’ve done it. No matter what the world looks like before a dip in the wild, it always looks much better afterwards as you clamber up the bank, dripping and exhilarated. As I’d stood at the edge of the pool dithering about whether to go in for my swim or not – feeling, I must admit, mildly ridiculous – it was Roger’s voice in my head that tipped the balance. ‘Come on in’, he said, ‘the water’s beautiful.’ And it was. 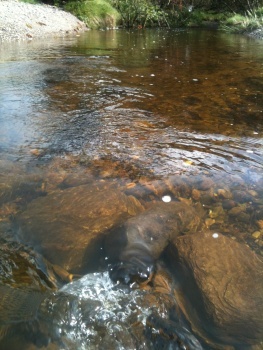 There’s loads of information about wild swimming at www.wildswimming.co.uk.